Kenneth Joseph Aspromonte was Born on September 22, 1931 in Brooklyn, New York. Ken is the older brother of former New York Mets 1971 third baseman; Bob Aspromonte. 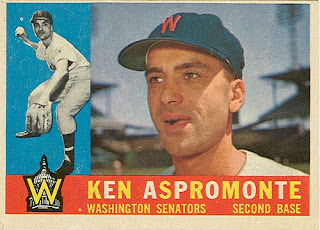 The six foot right handed hitting Ken Aspromonte also attended the famous Lafayette High School in Brooklyn in the late forties. In 1950 he was signed by the Boston Red Sox as an infielder. He did two years service in the military, serving in the U.S. Army during the Korean War doing radio broadcasting at SHAPE headquarters in Paris, France. He got back to playing baseball, in the AAA Pacific Coast League for much of the rest of the mid fifties. He was the PCL's 1957 batting champion (.334) leading the AAA San Francisco Seals to the pennant, the last season before the Giant left New York & came to town. Ken made it to the big leagues late in 1957 with the Boston Red Sox for 24 games. In just his second career game, he started at second base & got three hits in his home city of New York as the Sox beat the AL New York team 7-5. He would go on to have a seven season playing career as a reserve infielder with Boston (1957-1958) the Washington Senators (1958-1959) the Cleveland Indians (1960-1962) the Los Angeles Angels (1961) Milwaukee Braves (1962) & Chicago Cubs (1963). His best season was 1960 with the Indians playing in a career high 117 games batting .290 with 10 HRs 20 doubles & 48 RBIs. In 1963 he left the majors and went to play three seasons in Japan with the Chunichi Dragons & Taiyo Whales, batting a career total of .273 there. 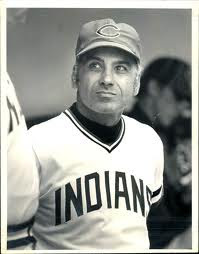 He came back to America & managed in the minor leagues for the Cleveland Indians from 1968-1971. He was promoted to their big league squad to manage for three seasons (1972-1974) finishing a best fourth place in 1974. 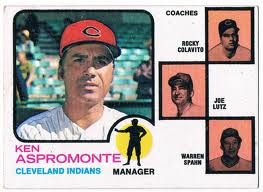 Aspromonte was the Indians manager for the classic “Ten cent beer night” disaster during that 1974 season. As the beer kept flowing & the fans kept drinking things got ugly. After they began throwing objects on to the playing field, the Drunken fans began to jump out of the stands & run onto the field. The two teams had previously had a bench clearing brawl toward the end of the 1973 season, and the Cleveland fans didn’t forget about it. 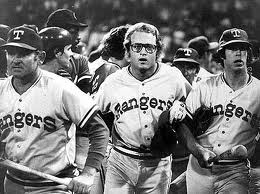 During the Ten cent beer night disaster, Aspromonte encouraged his team to grab bats & help the Texas players exit the field if needed. Aspro was succeeded by Frank Robinson in 1975, who made history as baseballs first African American Manager. During his playing career in America, Ken Aspro batted .249 with 369 hits 19 HRs 69 doubles 171 runs scored a .330 on base % & 124 RBIs. In 342 games at second base he posted a .969 % turning 229 double plays making 53 errors in 1691 chances. He also played at third base (56 games) short (13 games) first base 93 games) & one outfield game. Retirement: After his playing days he moved to Houston, Texas & has a long time beer distributorship there with his brother for Coors Beer.